That queer like smell – The Fife Post………..for genealogy and historical information. The boiling of Linseed oil for making the linoleum cement was the cause of the smell from the factories. 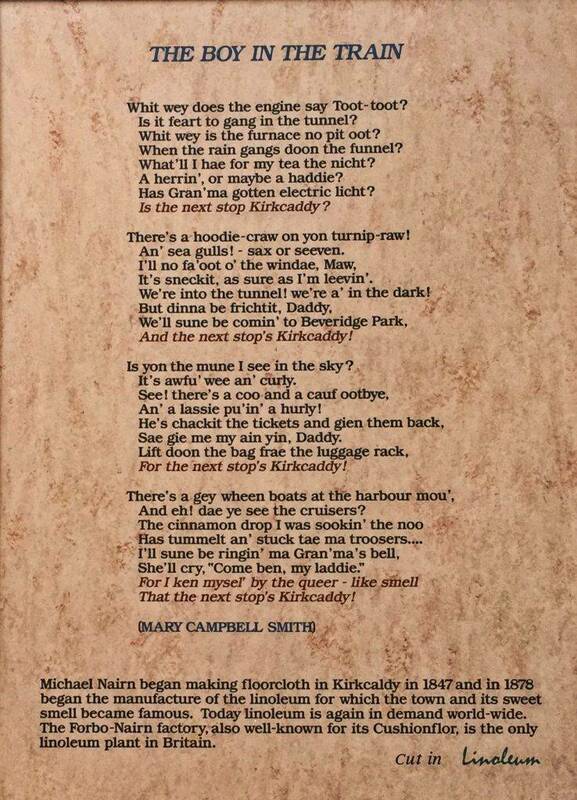 Many factories were around the railway lines which go through the town, hence the smell when approaching by train; this prompted the poem, by Mary Campbell Smith. Whit wey does the engine say Toot – toot ? Is it feart to gang in the tunnel ? Whit wey is the furnace no pit oot ? When the rain gangs doon the funnel ? What’ll I hae for my tea the nicht ? A herrin’, or maybe a haddie ? Has Gran’ma gotten electric licht ? Is the next stop Kirkcaddy ? There’s a hoodie – craw on yon turnip – raw ! An’ sea – gulls ! – sax or seeven. It’s sneckit, as sure as I’m leevin’. We’re into the tunnel ! we’re a’ in the dark ! And the next stop’s Kirkcaddy ! Is yon the mune I see in the sky ? It’s awfy’ wee an’ curly. An’ a lassie pu’ in’ a hurly ! Saw gie me my ain yin, Daddy. For the next stop’s Kirkcaddy ! There’s a gey wheen boats at the harbour mou’. An eh ! dae ye see the cruisers ? That the next stop’s Kirkcaddy ! Linoleum is still made in Kirkcaldy today.